The RH290-1 Anti-Theft Post Box was designed for daily use in unmanned receptions and high-risk areas where post-theft could be a problem. Manufactured to conform to EN13724 criteria, it meets the requirements set out in the Secured by Design Homes Guide 2016, and it is equipped with a range of safety features. 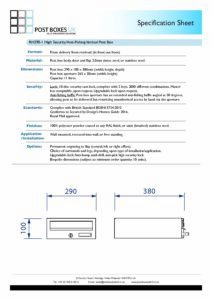 With dimensions of 290 x 110 x 380mm (width, height, depth), it can receive A4 size documents without bending, and it has a total capacity of just over 11 litres. As a modular mail box unit, the RH290-1 can be banked with ease to create a multiple mailbox unit. Post Boxes UK offers a fully integrated service, which includes design, drawings, delivery and installation. There’s no job too big or small, so contact us to discuss your requirements. 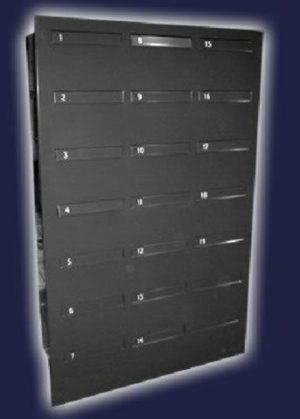 The RH290-1 anti-theft letterbox can be wall-recessed, wall-mounted, or installed as a freestanding unit raised on support legs. In addition to the standard neutral RAL finishes that are preferred by many property developers, the RH290-1 anti-theft horizontal post box is available in over 200 RAL colours. Other finishes include gloss, matt and satin, and we have a range of high-spec offerings such as premium metallics, chrome, and copper for those who are looking for something special. Where Building Control, Fire Regulations and BS476 compliance is required, we offer this letterbox with Class 0 flame retardant and fire-spread resistance paints. Post Boxes UK aims to deliver your RH290-1 mail box bank within 4 weeks of confirming your order. Larger more complex installations may take a little longer, but we will give you a clear indication of lead-times when discussing your project specifics. Manufactured from 2mm (as standard) or 3mm stainless steel and electro-galvanised steel construction make the RH290-1 high-security letterbox a solid and robust investment for indoor and outdoor installations. Once installed, we recommend you add the finishing touch to your RH290-1 anti-fishing postbox with finishing surrounds. In the case of wall-recessed letterboxes, these surrounds give a more integrated look, much like a picture frame. Trim options and finishes also improve the weather-resistance of outdoor installations. 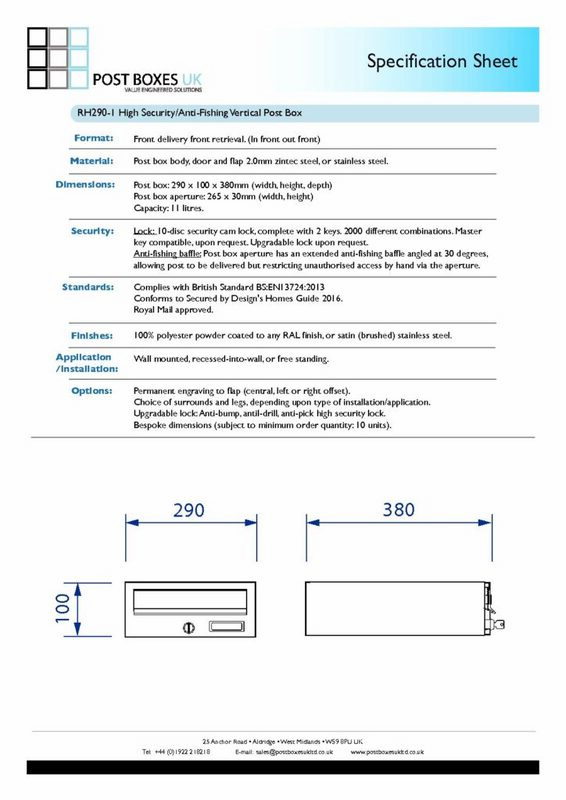 Post Boxes UK offers multiple support leg options for the Secured by Design RH290-1 letter box. 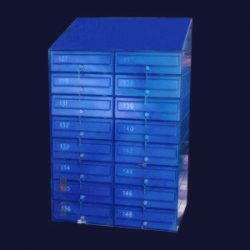 Side support legs and pedestal legs can be used individually or combined for wider mail banks. When considering your options, please bear in mind that the maximum recommended height for EN13724 compliance is 1800mm FFL (finished floor level). The RH290-1 anti-theft letterbox can be personalised with our engraving service. With a huge portfolio of Microsoft Windows fonts, we can replicate your company logo or business branding with ease. Apartment numbering, identification codes, and nameplate inserts are just some of the customisation options available. While the Eurolock Cam Lock included with the RH290-1 post box meets most requirements, Post Boxes UK offers many alternatives such as master keyed suites (UMK), digital locks, padlock compatible locks and many more. Please contact for advice on the right security solution for your mail bank installation. For property developers, receptionist teams, and management companies, Post Boxes UK offers replacement keys for all RH290-1 secure letter box models. We also offer replacement locking mechanism for those looking to upgrade, and discounts are available for bulk orders. As an anti-theft post box, the RH290-1 is one of the most secure models in our exclusive range. It is equipped with an anti-fishing device to comply with EN13724, and it supersedes the safety requirements recommended in the Secured by Design Homes Guide 2016. Being 2mm construction it is also significantly more robust than a standard apartment style mailbox. Exceptionally strong, durable, and designed to keep would-be post thieves at bay, the RH290-1 anti-tamper postbox is the smart investment for student accommodation projects, mixed-use schemes, and high-rise apartment blocks. It has a high capacity despite its compact dimensions, and it can be customised to complement every installation.